Hiking is in a way a national sport that Poles are passionate about regardless of age and not just one of many leisure activities available. And this is no wonder - given the trails through idyllic landscapes not to mention the welcoming guesthouses dotting the mountains. What was missing until now was someone with an organized and affordable tourist programme that would allow foreign tourists to wander the truly beautiful limestone mountain ranges without having to worry about baggage and other details. And that is where we come in! All you need to do is to come to Krakow by train, car or on one of the many affordable flights available. A mere hour's journey south of Krakow brings you to a hiker's paradise with blazed trails and charming mountain huts. The surroundings are truly picturesque - horses plough in the distance while flocks of sheep peacefully graze. And it is colourful as well -vivid red poppy flowers and dark blue gentians cover the ground contrasting with rows upon rows of golden haystacks piled up high. Particularly interesting are the bacowkahuts where the famous local speciality, oscypek, a cheese made from ewe's milk is produced. This is not just another anonymous alpine region as you will find out when hiking here. The unique landscape of the Carpathians steeped as they are in the regional culture makes a visit to the Beskid mountains an exceptional experience. The High Tatras, the mountain range known as the "Roof of Poland", dominate the region rising almost perpendicularly to the ground. Truly impressive even from a distance, they are bordered to the north by the gentle but variegated foothills of the Beskid range. The Pieniny, craggy limestone cliffs, penetrated by the deep Dunajec river gorge make these mountains particularly inviting for the hiker. The holiday can be tailored to your specific interests and preferences by using our modular program allowing you to book the modules you need. 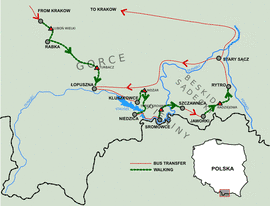 The traditional hike along the Beskid ridge takes 5 days. We have designed a week-long programme that best covers the beauty of the region with trails that are manageable for all, letting you do as much or as little as you want to. At the end of the 5 days you can either return to Krakow or continue your acquaintance of the High Tatras. Following breakfast you will be driven to a pass at a height of about 650 meters. The highlight of this first hike is the Lubon Wielki, rising like a wild mountain island from inhabited valleys. The 1022 m summit has some of Poland's most charming mountain huts that look like they might belong to a fairy-tale. From there you descend to Rabka, a small town with many parks known for its spa for children. The longest day-hike is planned for today through the forested Gorce range. Its highest peak is the Turbacz at 1310 m. It is a long but not difficult hike without too many ascents or descents. There are three mountain huts along the way where you can rest if necessary. There is a wonderful view of the Nowy Targ basin and of the High Tatras while descending followed by a walk through Kowaniec village to your three star hotel "Goralski Raj". This is the least strenuous leg of the trip. Our bus takes you from Nowy Targ to Kluszkowce. Your goal is the not very high but exposed Wdzar mountain (767 m) which can be climbed either on foot using the chairlift. 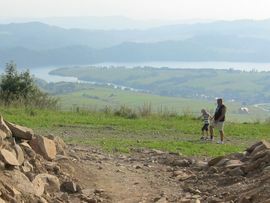 The mountain is a geological curiosity and offers an impressive view of the Pieniny, the Dunajec valley and two old castles in Czorsztyn and Niedzica above a man-made reservoir. You will have ample time to visit both ruins as there is a regular ferry service between the two. Overnight stay is in Niedzica on the Spis, an area that once was a part of the Austro-Hungarian Empire. 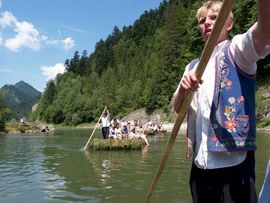 We will order a bus to bring you to Sromowce Nizne, shortly before the point at which the Dunajec begins its wild rush. 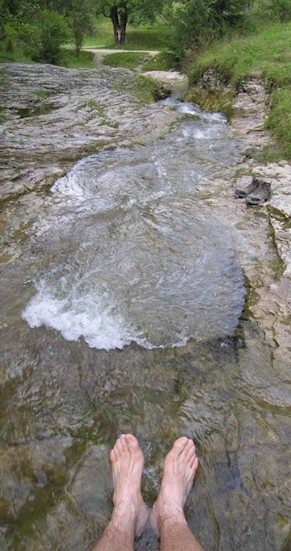 The river forms a natural border between Poland and Slovakia where it is now easy to visit the Carthusian monastery thanks to a new bridge for pedestrians. The limestone peak, "Three Crowns" (Trzy Korony, 982 m, 500 m above the river valley! ), arises majestically above the river. Hikers are well advised to climb the mountain as well as the viewing platform. Then we continue on to Szczawnica. 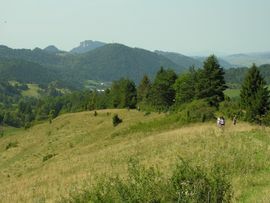 You can walk along the mountain ridge or along the Dunajec on the Pieniny trail hammered into the rocks. The raft trip down the Dunajec gorge, however, is the most spectacular option with huge jagged rock faces going up to a height of 300 m lining the two hour ride. You will spend the night in Szczawnica, an old and introspective spa resort with elegant villas and park cafes. 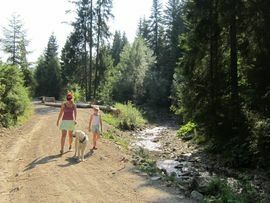 For a complete change of atmosphere the hike today is in the quiet Beskid Sadecki, covered with primeval mixed forests. One option is to go to the Jaworki village, where the Ruthenians once lived, with its old tavern and the Orthodox church. It is a region known for its numerous flocks of sheep still herded according to past custom. The goal of this leg is Rytro, a small holiday village, in the deep green valley of the Poprad river. One can see the ruins of a small 12th century castle in the distance. "Conquering" this castle will be your final hurdle of the day and sautéed trout in your hotel on the banks of the Poprad the reward for the day. Day 7: (Friday) We will order a bus for the day to first take you to Stary Sacz, the oldest town of the region as its name suggests and one of the most attractive small cities in Poland. It boasts an impressive convent and charming market square with narrow alleys lined by small and colourful houses. Following the tour of the city we will ride further to Krakow unless you are planning to extend your stay in Zakopane. The arrival in Krakow will be at 17:00 at the latest so that you can catch an evening train or flight. For those not travelling we recommend that you book an extra night in Krakow. The hiking season is from end-May to mid-October and autumn is particularly beautiful: September and October are the best months for hiking in the mountains. In the Polish language, Babie Lato is the name given to this particularly beautiful time of year. This is the time of year with the least showers and when the forests are at their most colourful. The mountain ranges are particularly inviting at this time for another reason as well - the clear autumn air that allows visitors a breathtaking view of the mountains. 6 overnight stays with breakfast and dinner, hotels (***) in Krakow Szczawnica and Rytro, Pensions (**) in Rabka and Lopuszna. All rooms have their own shower and bathroom. 3 transfers by bus: Krakow-Lubon Wielki, Niedzica-Sromowce, Rytro-Krakow or Rytro-Zakopane as the case may be. Lunches, small expenses on location: admission ticket to national parks and museums, rides using public transport, boat trips at the reservoir and the raft trip down the Dunajec.